Michigan-born dancer, musician, and dance researcher Nic Gareiss has been described by the Irish Times as “the human epitome of the unbearable lightness of being,” and "the most inventive and expressive step dancer on the scene” by the Boston Herald. His work re-imagines movement as a musical practice, recasting dance as medium that appeals to both eyes and ears. Gareiss draws from many percussive dance traditions to weave together a dance technique facilitating his love of improvisation, traditional footwork vocabulary, and musical collaboration. He has performed with many of the luminaries of contemporary traditional music and dance, including The Chieftains, The Gloaming, Darol Anger, Dervish, Buille, Solas, Liz Carroll, Genticorum, Bill Frisell, Colin Dunne, Bruce Molsky, Alasdair Fraser, and Martin Hayes. He collaborates regularly with Cleek Schrey, Maeve Gilchrist, Simon Chrisman, Allison de Groot, Brittany Haas, Jordan Tice, and as a member of the quartet This is How we Fly. 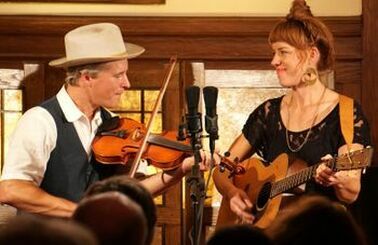 Reeb Willms and Caleb Klauder, of the internationally acclaimed Foghorn Stringband, make a dynamic duo that has been playing and singing together since 2008, performing professionally across Europe, Scandinavia, Australia and North America. Caleb grew up on Orcas Island, Washington and began playing and singing at the early age of twelve. He moved to Oregon in 2002 and has contributed to a number of influential and successful groups, namely: The Foghorn Stringband, Pig Iron, Calobo, and his own honky tonk band, the Caleb Klauder Country Band. His unique, powerful voice has captured many a heart. His recent collaboration with Jesse Lége, Joel Savoy and the Cajun Country Revival, is a combination of Caleb’s honky-tonk country band and legendary Cajun musicians Jesse Lége and Joel Savoy. Reeb was raised in Waterville, Washington by a family of wheat farmers. She grew up listening to her father and uncles, the Willms Brothers, singing country and traditional songs. Reeb began singing and player guitar in her early twenties and quickly displayed a strong vocal style that is clearly her own. She is a respected and well-loved singer and joined the Foghorn Stringband in 2010. Her love for old time fiddle tunes and old country songs roots her in a classic American musical style. With Oregonian Gabrielle Macrae on fiddle and Barry Southern from Liverpool, UK on banjo, the Horsenecks play hard-hitting, heartfelt old-time music and classic bluegrass music. Their sound is centered around the pairing of Gabrielle Macrae’s signature rhythmic Appalachian fiddle style, paired with Southern’s driving yet subtle three-finger banjo playing. Gabrielle's playing style is the result of being raised in the old-time music hotbed of Portland, OR. She has experienced the fiddle traditions of the Southeast through years of traveling to festivals, learning directly from some of the greatest players in the genre. Barry's banjo playing ranges from thrilling and high-octane to moody and captivating. Performing fiddle tunes and songs from the late 1800’s through 1930’s, this original format of The Tallboys features all-acoustic instrumentation and a tight, authentic string band sound. Performing a variety of old time fiddle tunes from Appalachia and the mid-west, country blues, hokum songs, and early country, they’re sound is great for both listening and dancing! Their resident flatfooter & dance caller, Charmaine Slaven, adds a unique dance element to this group, enabling groups of both beginners and experienced dancers to enjoy some time on the dance floor. Charlie Beck and Charmaine anchore The Tallboys and Johnny Fitzpatrick will also be joining them on tunes during this performance. The Sassafras Sisters are a teen old-time stringband from Olympia. The trio, Annie and Ellie Davis and Ruby Neatherlin recently competed in the Allegheny Fiddlers Convention in Sparta, NC, where they took first place in Youth Stringband and Annie placed third in the Youth Fiddle category. They love singing old songs in three-part harmony and playing rousing southern fiddle tunes. Having grown up at the Oly Old Time Festival they are excited to perform as one of this year's Lounge Acts. Joanne Pontrello, Paul Denison, and Kelsey Nelson make up Les Coeurs Criinels and are and exciting new arrangement that we are excited to invite to Oly Old Time Festival to fill the dance hall on Saturday night. Lisa Ornstein, Frank Blade, and Jerry Gallaher make up the Invisibillies, and we are excited to have them at this year's festival! Jesse Partridge and Friends make up Hey George and will be entertaining us in the Lounge on Saturday Night ahead of the Big Dance! The Cully Cutups are Kaleb Clauder on fiddle and Reeb Willms on Guitar, joined by Tony Mates on bass along with additional guests. We are excited to have them playing this year's main square dance on Saturday night! We are fortunate to have long time caller Steph Noll from Portland join us for this year's festival! Kelsey hails from Lopez Island and we are excited she will be helping us kick off the festival, calling for Thursday night kick off dance! We are happy to have esteemed caller and tradition bearer Tony Mates calling at this year's festival, and also playing bass with The Cully Cutups for the Saturday night main dance.